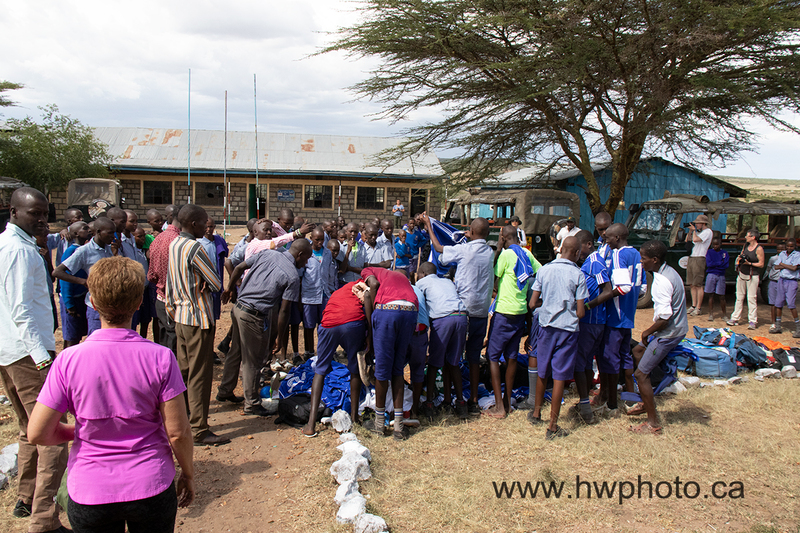 While in Kenya, we support Loigero Primary School, Mara Rianda Village, Mara Rianda School and Enkereri Primary School. HW Photo & Safaris collects donations for Africa throughout the year. When we go to Nairobi, we are each allowed two, 50- pound bags in our checked luggage. One bag is for the safari enthusiast. The other bag is for the school. These donation bags are full of school supplies, teaching supplies, children's clothes, shoes, soccer balls and soccer uniforms, towels, wash cloths and what ever else anyone wants to donate for us for us to pass along. The children loved the new soccer uniforms, shoes and soccer balls! These bags are given to Edmontonians going on safari with us. All they have to do is check the bag in at the Edmonton airport, then when it comes out at Nairobi the rest is taken care of. For those interested, HW Photo & Safari guests love playing soccer with the children. Many of the children don't have shoes. We are collecting shoes between trips to bring to the schools. Our safari guests aren't obligated to help us with the donations, but it sure is appreciated when they do. I'm not sure who enjoys the visits at the school more, the children or the safari guests. The great part of your financial donation is the money is going to the cause without being intercepted by overhead from administration and salaries. Millwoods Soccer Association for donating about 900 soccer jerseys, duffle bags and numerous soccer balls. Bank of Montreal for donating 65 soccer balls, Days for Girls for making washable feminine hygiene products and so many generous people who have donated clothing, school supplies, books and shoes Thank you especially to the HW Photo & Safari guests for allowing us to use their extra bag allowance so we can take the supplies over seas.